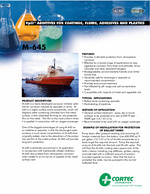 Description: M-645 is a newly developed corrosion inhibitor additive for corrosion induced by seawater or brine. M-645 is a highly surface active concentrate, which will displace water containing chlorides from the metal surface, is then adsorbed forming an oily protective film on the metal. This film is the most uniform when it is applied in conjunction with an oxygen scavenger. Package: M-645 is available in 5 gallon (19 liter) pails, 55 gallon (208 liter) metal drums, liquid totes and bulk.